Cut your energy costs by up to 70 percent and more ─ with the most efficient magnet-less pump motor in the world. 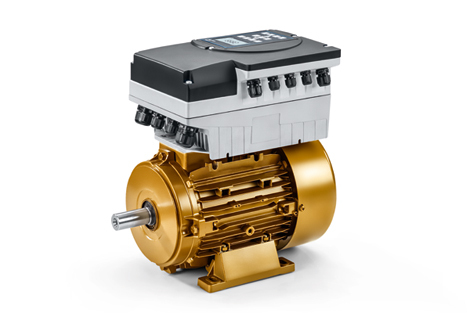 The KSB SuPremE® motor is so energy-efficient that it meets IE5* efficiency requirements. Discover the benefits of synchronous motor technology and familiarise yourself with the way this innovative drive solution works. Why the KSB SuPremE® IE5 motor* is so efficient is also explained in our interview with experts. The motors are well suited not only for driving pumps but just as well for powering fans and other rotating equipment. 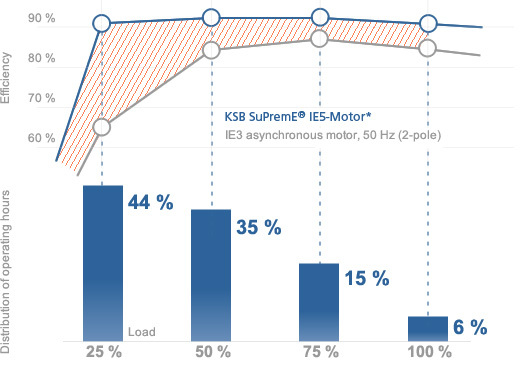 In combination with a PumpDrive speed control system, KSB SuPremE motors save up to 70 percent or more in comparison with fixed speed asynchronous motors. The motor alone can save up to 15 percent. Especially in the part-load range, the motors have major efficiency advantages over speed-controlled asynchronous motors. With KSB SuPremE® you satisfy the IE5 efficiency requirements to IEC/TS 60034-30-2 for electric motors according to the applicable ErP regulation up to 15/18.5 kW (only for 1500 rpm types rated 0.55 kW, 0.75 kW, 2.2 kW, 3 kW, 4 kW: IE5 in preparation). KSB SuPremE® motors have an excellent eco-balance. Their non-use of magnetic materials makes them much more sustainable than permanent-magnet synchronous motors or asynchronous motors. Thanks to the use of non-critical, long-lasting materials, the motors are extremely robust and durable. KSB SuPremE® motors are compatible with IE2 asynchronous motors. Their patented rotor design ensures an extremely low level of torque ripple (one to two per cent) and accordingly quiet operation. The efficiency advantage of KSB SuPremE® motors is apparent at full load, but even more so at part load. And that is exactly where most pumps' drives operate. KSB SuPremE® motors are not just extremely efficient; they are also very versatile. What makes the KSB SuPremE® motor so efficient is an interplay of numerous technical innovations. Learn more about the slender pump drive for the future. The matter-of-fact designation US patent 5.818.140 pertains to the special cut of the laminated rotor core. It is enormously effective, allowing only extremely little torque ripple (1-2%) for extremely quiet operation. KSB SuPremE® motors have an outstandingly small total environmental footprint. Their non-use of magnetic materials makes them much more sustainable than permanent-magnet synchronous motors and asynchronous motors. 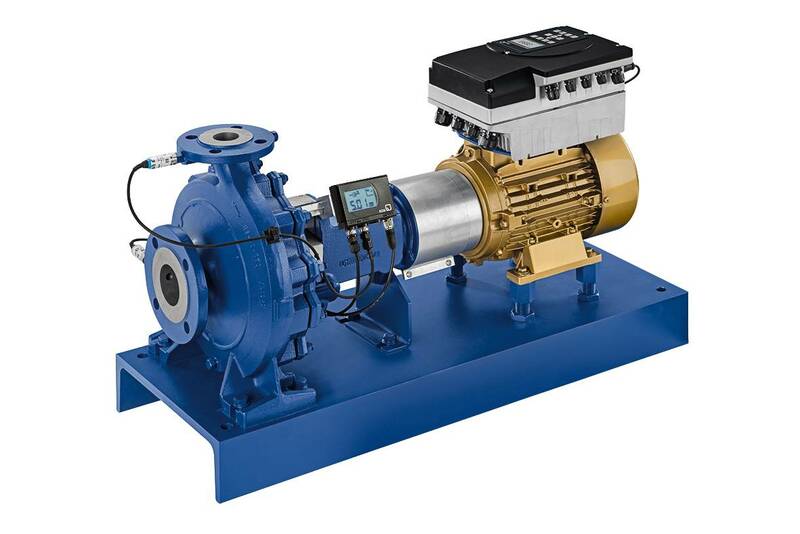 KSB's PumpDrive, which has proven to be very effective in combination with an asynchronous motor, adjusts the speed of the motor - and with that the pump's flow rate and head - to match current demand. KSB SuPremE® is the only synchronous reluctance motor with a motor-mounted speed control system. The reluctance principle is fully matured. Thanks to the use of non-critical, durable materials, KSB SuPremE® motors are as robust as asynchronous motors. Their lack of sensors additionally reduces the probability of failure. And the lower temperature of the rotor has a positive effect on the service life of the bearings. Wherever there is room for an IE2 asynchronous motor, a KSB SuPremE® motor with identical connecting dimensions can also get the work done efficiently. Get yourself a quick overview of how much money we can save you on a specific-case basis. In order to achieve top efficiencies, all the components of your system need to be perfectly matched to each other. We therefore systematically optimise the energy efficiency of an entire hydraulic system via our FluidFuture® concept. This comprehensive analysis of the overall system combined with our expert knowledge enables us to realise maximum savings in four steps and markedly reduce your operating costs. As well as the KSB SuPremE® IE5 motor*, many other smart products and services from KSB are used.